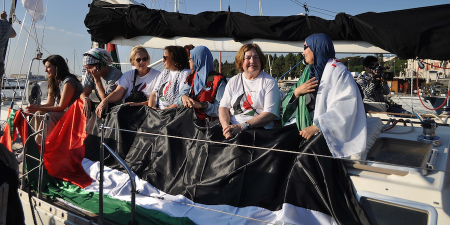 After sailing for several days, the adventure of 13 pro-Palestinian women ended abruptly, when Israeli commandos illegally boarded the Zaytouna-Oliva in international waters, on 5 October, 2016. The Zaytouna set sail from Barcelona in mid-September, under the banner ‘Women’s Boat to Gaza’ (WBG). The yacht stopped in Sicily before proceeding onto Gaza, to challenge Israel’s almost decade-long siege on the coastal enclave. Other women on the voyage included retired US colonel Ann Wright, former South African Olympic volleyball player Leigh-Ann Naidoo, Algerian MP Samira Douaifia, New Zealand Green Party MP Marama Davidson, and first substitute MP in the Swedish parliament Jeannette Escanilla. One of two Al-Jazeera journalists aboard, correspondent Mina Harballou, explained that when the Zaytouna was intercepted from the west of Israel, at around 4pm, “there were two warships, one on the right and the other on the left of the boat.” Three more Israeli naval ships then surrounded the Zaytouna and ordered Captain Wright, to redirect its course. “There was no violence from either side,” Harballou concluded. The Israeli navy reportedly cut off the boat’s communication system before the takeover, preventing the Al Jazeera correspondents from broadcasting the event live. A statement released by WBG, as Israelis forces took control of the boat, said that the women on the Zaytouna were waving towards the shores of Gaza, where they knew Palestinian women awaited their arrival. Wright reported that, while Gaza remained dark in the distance, two Israeli oil rigs were illuminated. “Israel deprives the people of Gaza of their resources, no electricity and no water,” Wright explained. Sabine Haddad, spokeswoman for Israel’s Interior Ministry, said that 11 of the passengers were detained for 96 hours, between Givon Prison and Ben-Gurion airport. Haddad added that the women were given the option to leave Israel before 96 hours had passed, but refused. Some of the activists attest that Israeli authorities prevented them from sleeping while in jail. The two other women on board, both journalists, were deported from the area immediately, and returned home on 6 October, 2016. WBG is the latest initiative of the Freedom Flotilla Coalition, which sends pro-Palestinian activists to Gaza by boat, each year, in protest of the Israeli siege. WBG initially consisted of two boats, but the second, the Amal-Hope, had to end its trip early, due to engine problems. The last time a Freedom Flotilla Coalition expedition successfully reached Gaza was in 2008. Every year since, Israel has stopped the flotillas at sea. One such operation turned into tragedy, in 2010, when 10 Turkish activists were killed after Israeli navy commandos stormed the Mavi Marmara flotilla, while on its way to Gaza. Madeleine Habib, the captain of the Zaytouna, stressed: “It’s really important to keep the Palestinian story in focus. I know there are many problems in the Middle East, and [it] is a troubled area, but, this doesn’t mean that anybody’s suffering is less worthy of attention than somebody else’s.” ~Mercedes Iñiguez. Mercedes Iñiguez is a journalist who has worked for The Guardian, Il Sole 24 Ore , and La Vanguardia. She specializes in human rights, with a focus on women and gender.